Show her you care by crafting mom (or the mother figure in your life) a beautiful handmade crocheted gift! Whether you’re a beginner or advanced, looking for a quick craft or planning a big surprise, here’s a round up of some of our top patterns and crochet gifts for Mother’s Day! Expect pretty flowers, elegant shawls and accessories we’re sure she’ll love! This Weekend Cowl designed by Ana D is just gorgeous! An elegant accessory that she’ll love teaming with her favorite outfits. Beautifully designed, you can craft using a soft supple worsted yarn in her favorite shade! Use this FREE pattern and craft these gorgeous flowers to embellish your handcrafted gifts, garments or even use as table confetti or decor for your perfect day with mom! This Kali Flower Crochet was created by Joyce Yu and is bloomin’ lovely! Whether your mom’s a master crocheter or total beginner this beautiful collection of crochet stitches and techniques is a MUST for all crocheters. The Handbook of Crochet Stitches by Betty Barnden is a must for all lovers of the craft! Give mom this blissful hand crafted cardigan this Mother’s Day! Designed in Caron Simply Soft she’ll love wearing this cozy and versatile garment, that goes with pretty much everything! Although you’ll need to plan ahead, this pattern is easy to crochet and even suitable for beginners! Fresh and lovely, this shopping tote bag from Bernat makes a wonderful practical gift! Designed using Bernat Handicrafter Cotton Solids, this light and cool tote is both practical and pretty! We are just falling head over heels for this crochet scarf by Annemarie Benthem. This thick and cozy scarf is both understated and fashionable making it a wonderful gift for mom, grandma or aunty – whoever the mother figure is in your life! This pattern uses Rico Basic Super Big Aran which comes in a palette of gentle soft shades – so take your pick! To moms who love tech, crochet this fantastic Flower Patch tablet case by Annemarie Benthem! Composed of panels of beautiful floral squares to give a flourish of field flowers! This was designed in Paintbox Yarns Simply DK, but you can also whip one up using your stash yarn too! Mom deserves to put her feet up, so why not crochet her these glorious felted slippers by Knot Sew Cute Design shop. Soft and cozy, she’ll love her very own pair made by yours truly, using worsted & 10 ply wool for a wonderful gift! Still not sure what to get mom for Mother’s Day? 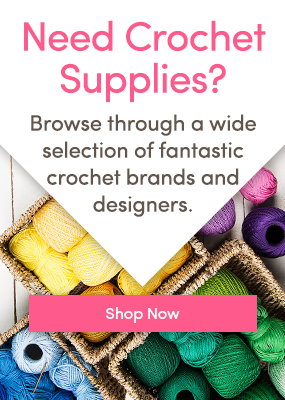 Why not give her a LoveCrochet gift card! Whether she needs some new crochet tools or could do with stash update. If we know mom, she’s a lady who knows what she likes – so why not leave it up to her to choose! All you need to do is select the amount of credit you’d like to add, which can be anything from $10 – $250, then leave the rest to mom! What are you crocheting for Mother’s Day? Share with us in the comments below! 5 FREE Project Ideas for Last-Minute Gifts! Mother’s Day gifts and treats! Last minute crochet gifts! Get ahead with those gifts! Christmas is coming!